!! You're going to want to scroll to the bottom for more of this snowy goodness! Parker + Diana found love in a few pairs of hiking boots. These two met in Oakland, CA and discovered their shared affinity for the outdoors. They thrive in each other’s company, and find quiet in long hikes together. They have conquered climbs like Half Dome in Yosemite and a sunrise hike in Bali, Indonesia. 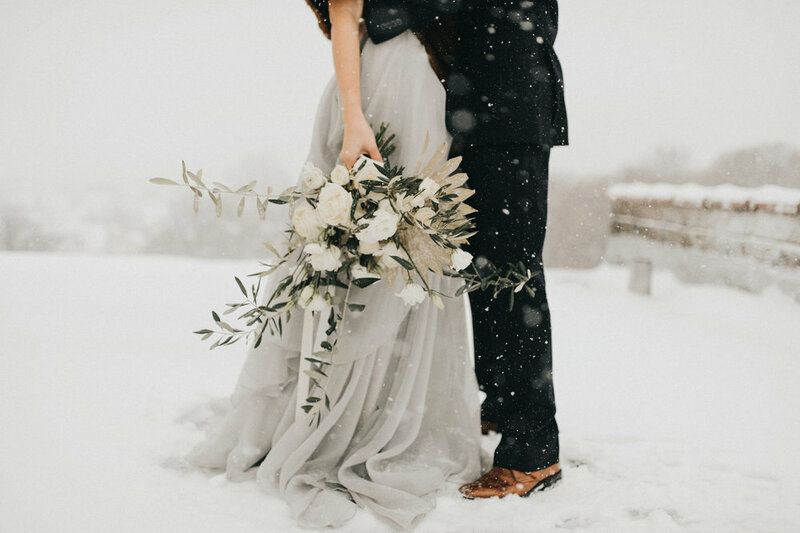 On this snowy December day, wedding planner Olivia Nicoletti and designer Maureen Higgins brought them down to sea level for a moment to showcase their love. Maureen and I, both Rochester, NY natives, are old friends who have shared many of life’s highlights with each other, but perhaps the sweetest moments have been the opportunity to support each other’s dreams. This shoot was a collaboration - I orchestrated the logistics, while Maureen, of Stone Fruit, crafted the design - to launch my new venture, Olive Fine Weddings & Events. This partnership seemed apt since Maureen’s drive, creativity, and fearlessness inspired me to finally put the wrapping on this years-old ambition. 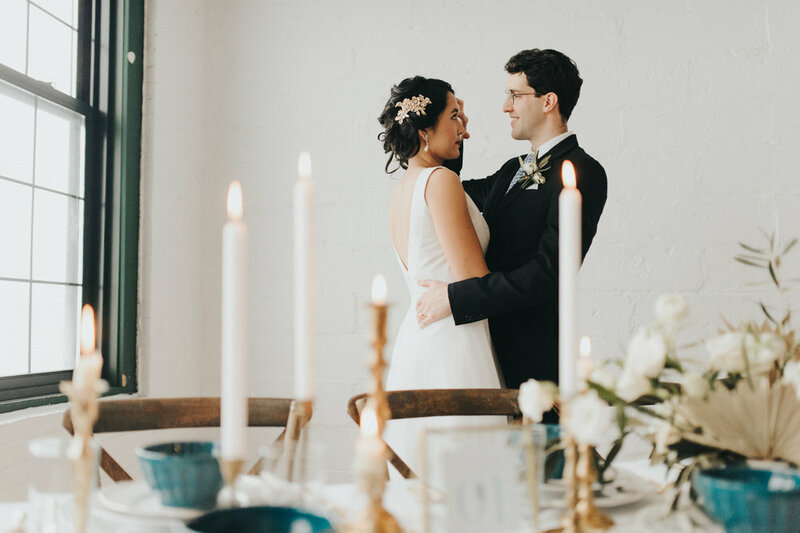 We surrounded ourselves with vendors we love, admire, and trusted to execute Maureen’s design, including RachelLizPhotography, who lent us not only her gorgeous photography skills, but also her dreamy loft space at Rochester’s Public Market. No small business can flourish without the support of trusted advisors, like Maureen, and family. 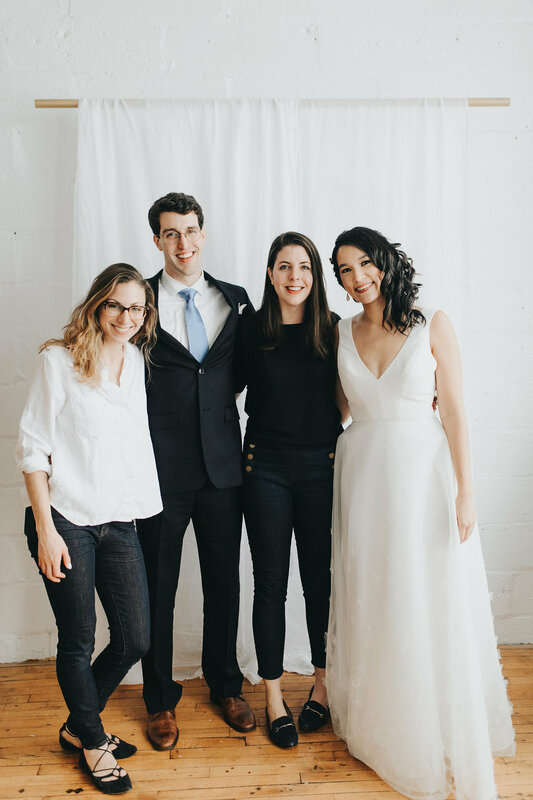 Parker + Diana are my family; my handsome brother and his girl agreed to be our bride and groom. Throughout the shoot, my eyes brimmed with tears, watching the love my little brother and his lady share for each other. Their connection is genuine and the love in the room was palpable. When Parker + Diana turned around for their first look Parker got on one knee - and the entire room held their breath! No engagement (yet! ), but he was so moved seeing his girl in that dress, that he fell to his knees. Diana’s first gown, a grey metallic number from Lovely Bride’s Dear Heart collection, enhanced the styled space, providing movement and a lightness to the moment. It complemented the bride’s gorgeous features, highlighted by Linda Vaskoski Howard of Bridal Biz Beauty. To give the models a stage, Maureen gracefully handled all of the design, from crafting one-of-a-kind stationery, to draping the table just so. I’ll let her pick up the story in her own words. When I set out to design the scene and stationery, I started by imagining the quintessential Olive bride. She’s classic (a little understated) but elegant and stylish. She may live in an urban loft, but upon a visit to Greece with her Love, she’d collect a piece of olive branch that she’ll carry home because she’s sentimental. She dresses in modern clothes, but wears heirloom jewelry to remind her where she came from. (Olivia, classic and sentimental herself, borrowed her husband’s wedding band for our groom and brought her Grandmother’s jewelry to adorn our bride.) 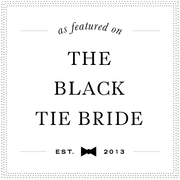 The vision of the bride’s olive branch memento inspired the stationery. I wanted the paper goods to feel like new heirlooms that the bride and groom would want to pull out of a box to hold and admire on anniversaries. To give the pieces this feel, I created cyanotypes from a piece of real olive branch, a process that’s done by laying an object on a piece of photosensitive paper and leaving it out in the sun - somewhat of a challenge in the grey Rochester winter! I combined the cyanotypes with delicate pen and ink drawings of olive branches that I drew during the creation of the logo for Olive Fine Weddings. 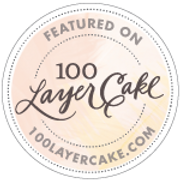 Vellum overlays, green-gray envelopes, and vintage stamps rounded out the paper goods to create texture and depth that can be seen and felt through the images. To pull the olive branch into the scene, it appeared on the hand-painted backdrop where Parker and Diana had their sweet first look. To give the modern loft space a touch of the classic, we brought in vintage furniture from Revival Rentals, including the blue velvet settee our whole crew was drooling over. The table featured the dishes I use everyday at home: gold-rimmed plates from Crate and Barrel and blue-green cereal bowls from Anthropologie. For the flowers, we asked for classic romance with a touch of playful and organic, like the bride herself. Skyvanah captured our vision perfectly by nestling unexpected artichokes and fan palms between white roses, ranunculus, and olive branches. This seamless day of bridal beauty, genuine love, and a natural design and logistics collaboration cemented plans for a partnership between Olive Fine Weddings & Events and Stone Fruit. Olivia will offer her couples design packages imagined by Maureen and Maureen will pass the logistics to Olivia. This partnership will allow couples to think about their weddings holistically, and feel inspired to tackle the details. For the real couples in the thick of wedding planning: we’ll leave with with some advice. From planner Olivia: Wrap yourself in the traditional, but let yourself be excited by the modern. Weddings represent a snapshot of your life, now. Honor family traditions and special relationships, but don’t worry so much if your dress is a little more on trend over traditional, or if the groom wants to keep his new beard. You will be filled with such love each time you view your photos because your perfect wedding was just the beginning of an even more perfect marriage. From designer Maureen: I’m all about the details when it comes to a wedding, but when planning your design, it’s important to start with the big picture. Let pretty little details inspire you but be willing to abandon things that don’t fit when you grasp the bigger picture of the day. This photo shoot began with an olive branch, so I initially imagined a lot of soft green, but after experimenting with cyanotype prints for the invitations - a process that produces a blue image - and after seeing the grey gown, blue and white became the dominant palette. Maureen and Olivia’s collaboration created a flawless afternoon of laughter, love, and inspiration. But perhaps the most memorable moment of the day was when everyone noticed that the dreary, rainy afternoon turned into snow. Lots and lots of big, flaky snow. 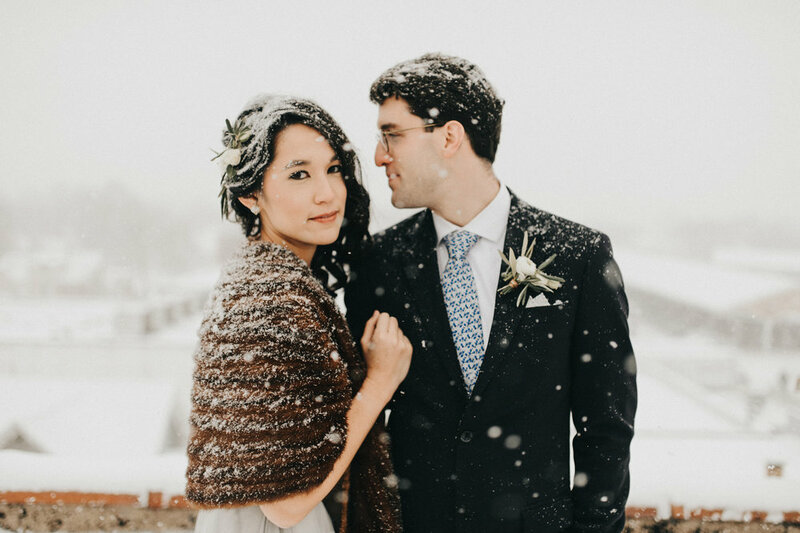 Diana wrapped herself in Olivia’s great-grandmother’s fur, Rachel hurried us up to the roof of the building, and captured breathtaking snowy bride + groom portraits. It was pure magic. Do you just die?! The snow. Amazing. And if that wasn't enough... an amazing video clip from A-Frame Digital!